This past Friday, April 5, the art and art history department’s sixth annual pARTy brought Swarthmore staff, faculty, and students together to enjoy food trucks and live music while viewing the art installations from students in ceramics, painting, drawing, photography, and sculpture. Around 800 community members flocked to Beardsley Hall to mingle at one of the most anticipated annual parties at the college. As students approached Beardsley Hall, they were immediately hit with the smell of freshly baked waffles and fried chicken drifting from the event’s two food trucks: Foolish Waffles, which offered sweet and savory waffles, and Chewy’s, which offered gourmet sandwiches and burgers. Once inside, an attendee could see the three floors of Beardsley Hall bustling with activity and conversation. The first floor offered mingling space where students could view sculpture works from students in the studio art department, get beverages, and snack on their food. 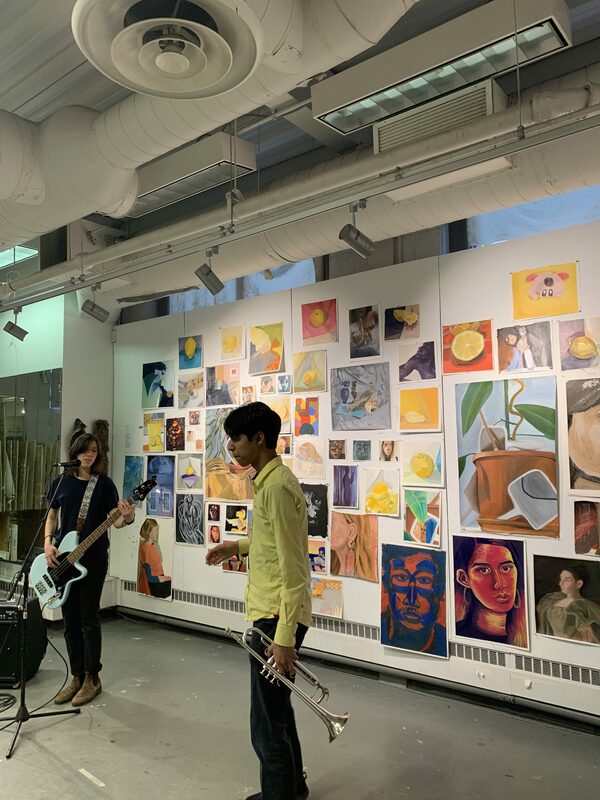 On the second floor, the sounds of music immediately captivated students and drew them to the painting studio, where three bands – Caboose, Goblet, and Funk the Patriarchy – performed throughout the evening. Partygoers swayed and sang along with the music; some even danced in front of the band. Some explored the painting studio while listening to the music, noting the brightly-colored still life paintings of lemons and vases decorating the walls. Outside of the painting studio, the walls of the hallway were covered with sketches from the Foundations of Drawing course; a multitude of subjects – people, bicycles, ice cream, spoons, and stairs – were portrayed using a variety of mediums – pen, pencil, ink, and charcoal. Finally, the third floor offered a multitude of activities – more food, rooms for karaoke, a photo booth, and a collection of ceramics on view in the studio. 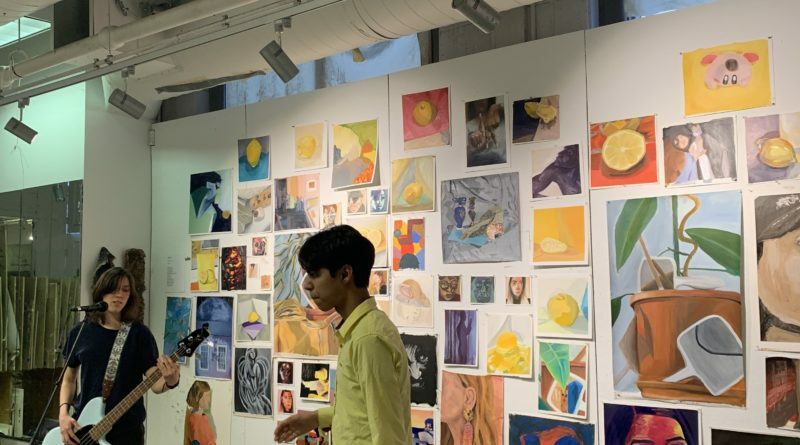 The third floor also featured the studios of senior art majors; most majors sat in their respective studio spaces and showcased their artwork, processes, and individualized workspaces to eager art appreciators. Michael Thut ’19 showcased his senior studio along with the artwork he has crafted over the last semester, including an installation in the stairwell of Beardsley Hall. He works with sculpture and 3-D space, creating aluminum sculptures of twisting, curvilinear lines. In particular, Thut is interested in blending mathematics and art in an interdisciplinary manner to explore the movement and interaction between his cantilevered aluminum lines. Thut explained his experience showcasing his work and receiving feedback at this year’s pARTy. James Garcia ’19 displayed his ceramics in his senior studio; specifically, he showcased his own investigation of ceramic chimineas, small chimneys used as stoves to burn wood. He enjoys abstracting geometric modular forms while simultaneously maintaining a functional element. Garcia shared his experience of showcasing his senior study last Friday. pARTy is a distinctive social occasion at Swarthmore. The event blends socializing and art appreciating in a unique and inclusive party environment. Unlike most wet parties at Swarthmore, pARTy offers a space that celebrates conversation and socialization. Students over 21 can drink in a safe, open environment, which many students have difficulty finding in other social spaces on campus. Furthermore, it is one of the only events on campus where staff, faculty, and students come together to enjoy each other’s company. Ananya Bhattacharya ’21 discussed the unique social environment at pARTy that facilitated socializing with unfamiliar party-goers. Ultimately, pARTy is a celebration of a department that is often overshadowed by larger departments on campus. The art and art History department believes that pARTy is an opportunity to showcase the arts on campus, whether that be the art history curriculum, works from studio art classes, student music groups, or the MakerSpace. Many who attend pARTy have never stepped foot into Beardsley Hall before but leave with a greater appreciation of the art scene on campus. Kaavya Arakoni ’21 explained how pARTy can serve as an entrypoint to Swarthmore community members who may be unfamiliar with the campus’s art scene. If you missed this year’s pARTy, do not fret; stay tuned for the seventh annual pARTy next April! Elena '21 is from San Francisco and plans to double major in art history and sociology/anthropology. Her favorite author is Elena Ferrante and one day she hopes to successfully finish a Saturday NY Times crossword puzzle.